Culms: Erect or decumbent, tufted, flattened, often bent near bases. Blades: Flat, 2 to 10 inches long, less than 1/4 inch wide, rough; tips tapering to points. Sheaths: Glabrous, usually loose, flattened; margins sometimes hairy. Ligules: Short membranes, fringed with hairs. 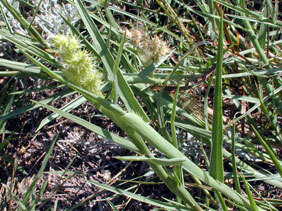 Inflorescences: Spikes, 1 to 3 inches long, terminal, sometimes partly enclosed by upper leaf, often purplish when mature; burs 6-20, hard, hairy, armed with 30-65 stout spines, enclosing 1-3 spikelets. Spikelets: 2-flowered, upper floret perfect, lower floret sterile; glumes unequal; tips pointed; lemmas narrow, glabrous; tips pointed. Habitat: Waste areas, cultivated fields, roadsides, and lawns, on sandy or gravelly sites. Forage Value: It provides good forage when immature but has no forage value after it forms burs. Comments: Tufted. Sandbur is a common weed that sometimes forms large mats. The burs cling to clothing and fur and can injure the eyes, noses, and mouths of livestock.